Fall is here and I love it! I love the crunchy leaves beneath my feet and the chill in the air. I don’t even mind the dark encroaching on my daylight. As any good New Englander does, we let our toes freeze a little and allow the chill to creep indoors as we count up how many days we can go without turning on the heat. The best way to survive this count-up, aside from finding a good book and curling up under a wool plaid blanket, is to keep the stove and oven working all day long. The kitchen is the heart of a home and if you keep it busy all day, you’ll be nice and toasty. Turkey, cranberry, sage, and gravy. 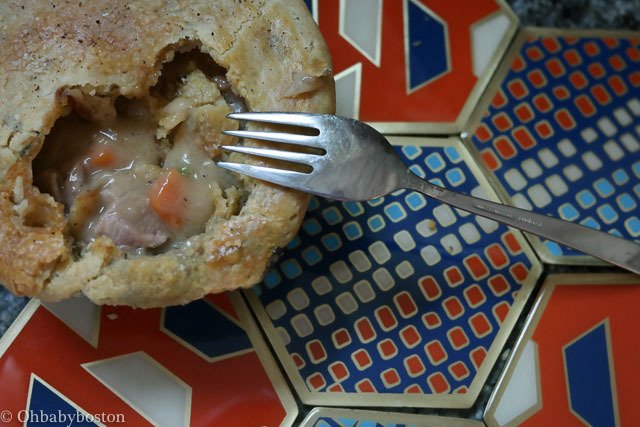 All essential Thanksgiving flavours which make this tasty pot pie a neighborhood favourite. Thanksgiving in a pie. 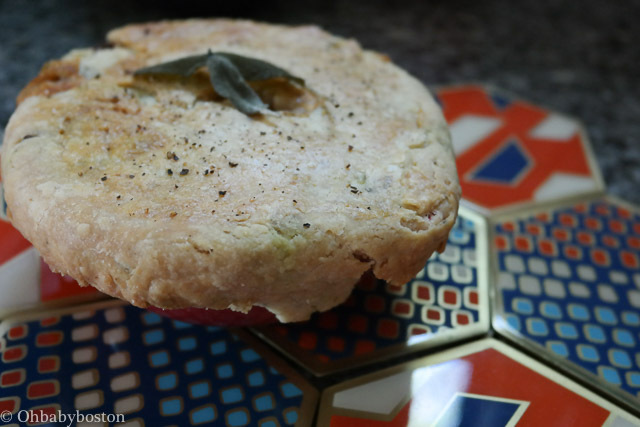 Although the official title of this pie is Fall is Here and I Feel Like Wrapping Myself in a Plaid Wool Blanket Pie, it is a cranberry turkey pot pie with sage crust. I took inspiration from Waitress with this recipe name because I loved their pie names. 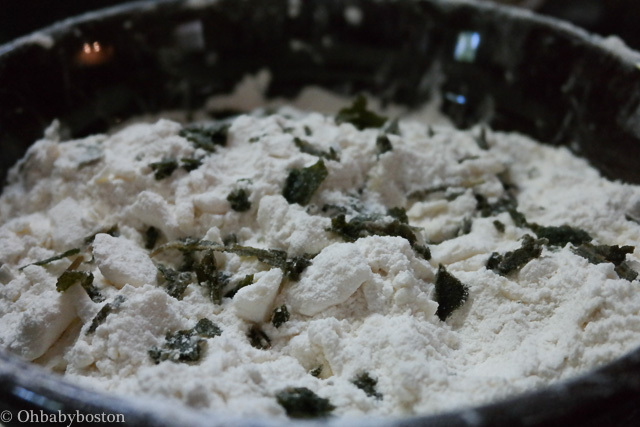 Fried sage leaves crumbled into the pie crust ingredients. How you cut, grate, crumble and mix is all an important part of what makes this crust perfectly crisp and flaky. You will need about 2 cups of cubed turkey meat. A little more or a little less is okay too. 2 tsp of jarred bouillon such as Better than Bouillon or 1 1/2 Bouillon cubes. This pie is prepared in five major steps. First, you fry the sage. Second, you roast the turkey. Third, you make the stock. Fourth, you make the pie crust. Lastly the filling is made and the pie is assembled and baked. 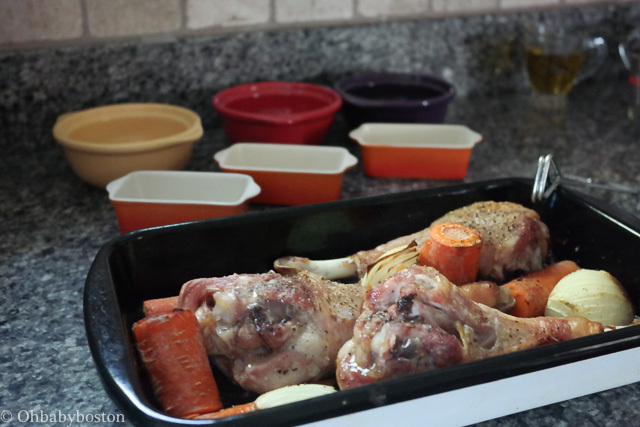 Before you begin, preheat your oven to 375 ℉ to roast the turkey drumsticks. Take the turkey drumsticks out of the fridge and leave them unwrapped on the counter so that they will not be too cold before roasting. If your pie crust shortening and butter is not frozen, stick it in the freezer now before you begin. Perfectly crisp and mellowed sage leaf. To fry the sage you will need a small saucepan with a tight fitting lid. Make sure your sage leaves are fresh and do not have droplets of water on them before you start. Combine 1/2 cup of canola oil and 1/2 cup of olive oil into your saucepan and bring the temperature of the oil up over medium heat. It will only take 3-4 minutes to heat the oil. If you drop a droplet of water into the oil and it sizzles and dances about, the oil is hot and ready. Put a plate near the stove for your fried sage leaves and have a fork or tongs ready nearby to extract the fried leaves. With the saucepan lid in hand, take 5-7 sage leaves at a time and toss them into the oil and immediately cover the pot. You will hear lots of sizzling and spattering. Once the sizzling stops the leaves are ready to be extracted from the oil and carefully placed on a plate to cool. Continue with all the sage leaves until they have all been fried. Sprinkle the sage leaves with a little Kosher salt. Remove the oil from the heat and let it come to room temperature. Before roasting the turkey drumsticks make sure your sage oil is at room temperature. While the turkey drumsticks are roasting you can start making the pie crust. To roast the turkey, you will need a medium sized roasting pan, two carrots and one onion. Peel the onion and cut it into quarters. Wash the carrots and cut them into thirds. Take the cooled oil that you used to fry the sage leaves and in the roasting pan, drizzle 1 TBSP of the oil over the turkey. Rub the turkey with the oil and then sprinkle with salt and pepper. Add the vegetables nestled in between the turkey and drizzle another TBSP of oil over the meat and vegetables. Roast for about 1 hour until golden brown and cooked through. When the turkey and vegetables have finished cooking. Let them cool on the counter until the meat is cool enough to handle. Take out a large stock pot. Once the meat is cool enough to handle, with a sharp carving knife, hold the drumstick upside down with the bone in your hands and the meat side on a cutting board. Slice your knife along the bone from the top down to remove the meat from the bone. 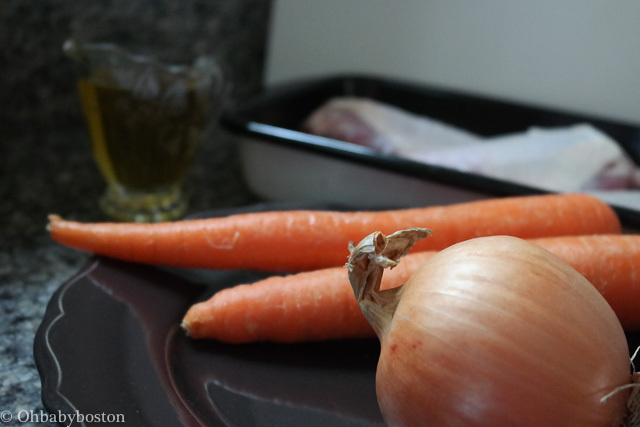 Remove the skin from the meat and toss the skin, vegetables and bones into the stock pot. Then, in the same stock pot add 6 cups of water, the roasted vegetables. 5-6 whole peppercorns, the bayleaf, and 1 1/2 tsp. of salt. Bring the stock to a boil. Once it starts boiling reduce to a simmer. You can leave the top off the pot (it makes the kitchen nice and steamy) but you may need to add a little water so that you will have 5 cups of stock at the end. You can adjust this later. Let the stock simmer for 45 minutes to an hour while you make the pastry crust and filling. You can turn the oven off for now. How you cut, grate and mix in the fat into your flour makes a big difference in the final crust. 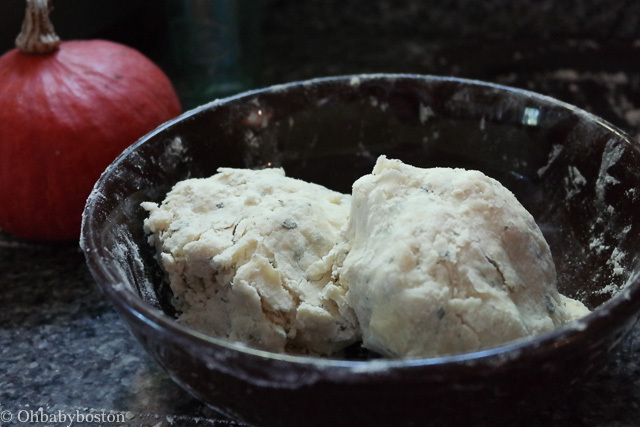 To make your pie crust, mix 3 cups of flour with 1 tsp of Kosher salt and 1 tsp of baking powder. Mix it all together with a whisk or a fork. Take your 1/2 cup of shortening out of the freezer and dice it into “pea sized” cubes. Sprinkle the cubes into the flour and gently toss them to coat separating any pieces that are stuck together gently with your fingers. Then, take your stick of salted butter out of the freezer. Grate the stick of butter with the large side of the grater. 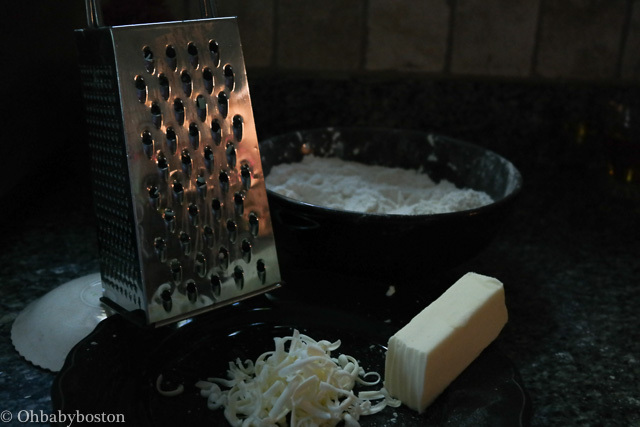 If the butter gets hard to handle, just flip it over and hold it from the side you started grating from. Mix the grated butter into the flour and shortening and toss to coat with flour. 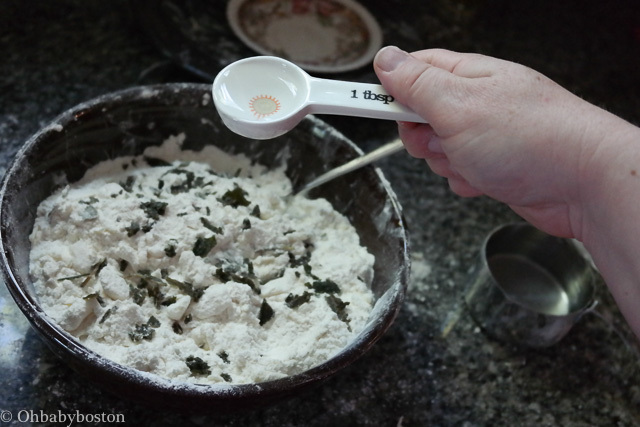 Continue to mix with your fingers until the butter and shortening are well coated in flour. Then, crumble all but 8-10 of the fried sage leaves, into the pie crust mixture. 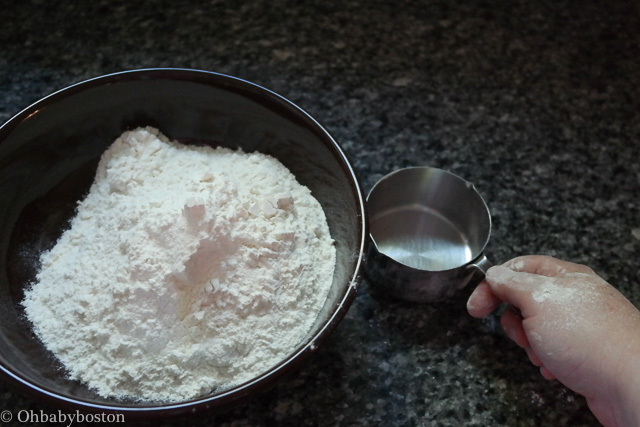 Put about 1/2 cup of ice cold water into a bowl and then add 1 TBSP of water to your flour mixture. The dough will begin to feel cold and then you know it has just about enough water. Mix the water into the dough 1 TBSP at a time using a fork and you fingers alternately. You should need 3-5 TBSP total. Once the dough begins to feel cold as you mix it with your fingers then add one last TBSP of water. The dough should be still be quite dry and crumbly but wet enough to stick together. Knead the dough together just enough so it will form a nice ball (albeit a slightly crumbly ball). Spread plastic wrap onto the counter and try to ball up 1/2 the dough as much as you can by squeezing it together with your hands. Place one ball on the the plastic wrap and then tightly wrap the dough ball up. 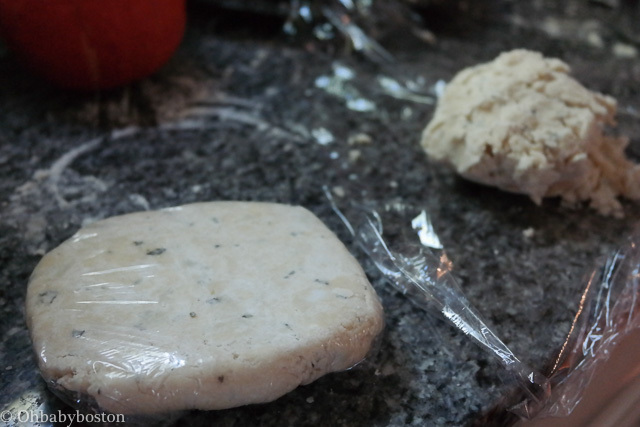 Flatten the dough in the plastic wrap so you have a flat wrapped disc of dough. Do the same with the other 1/2 of the dough. Put the two discs into the fridge and allow them to chill for 30 minutes. The dough is just wet enough to stick together. It is okay if some of the flour crumbs are loose. Just add them on top of the dough ball and when you wrap the dough up and press it together they will be absorbed. While the dough is resting, you can begin prepping the filling. Allow the stock to keep simmering on the stove. Add a second small pot of salted water to the stove and bring it to a boil to blanch the carrots in. Peel two carrots and dice them into “pea sized” morsels. Once the water has boiled, blanch the carrots for 2 minutes and then rinse or dunk in cold water to stop the cooking. 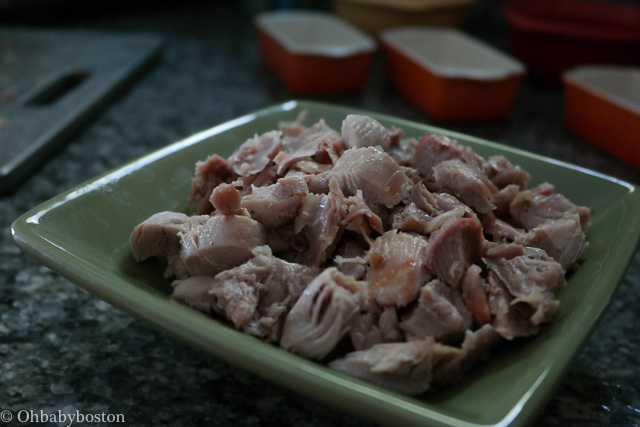 Take the turkey meat and cut it into small cubes. Dice the turkey meat into cubes and set it aside for your filling. Take the peeled pearl onions and if they are large like the pint I have, you can halve or quarter them. In a medium sized sauce pan or Dutch oven, melt your 1 1/2 sticks of salted butter. These onions come in a pint size package at the market already peeled. 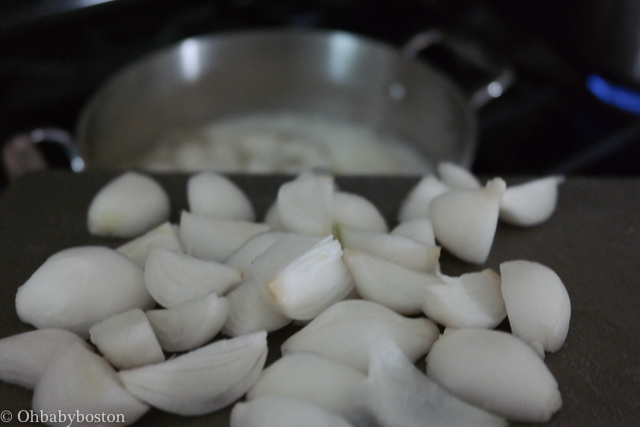 Toss the onions into the melted butter and sauté them over medium-low heat for 10-15 minutes. Butter and onions are a match made in heaven. 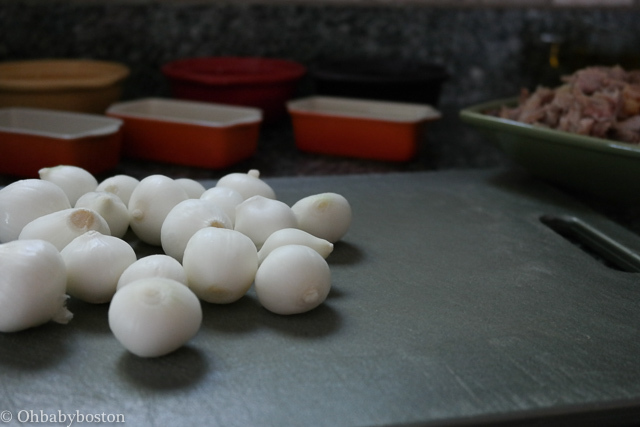 While the onions are cooking, get a large bowl to drain your stock into. Set the bones and vegetables aside and put the stock back into the stock pot. As you pour the stock into the pot measure it and make sure that you have 5 cups of stock. You can do this by straining it into a bowl and then measuring it with a liquid measuring cup as you put it back into the pot. If you need to add a little water, do so now. Then, add 2 tsp of your Better than Bouillon or your two bouillon cubes to the stock and stir until dissolved. Keep the stock simmering on low. Make sure your sauce pan or Dutch oven can hold all of this. Although you just start with butter and onions there is a lot more to fit into the pot. Now that your stock is ready, head back to your pan with onions and add 3/4 cup of flour to the onions and butter. It will seem a little thick and messy but just stir it all together. 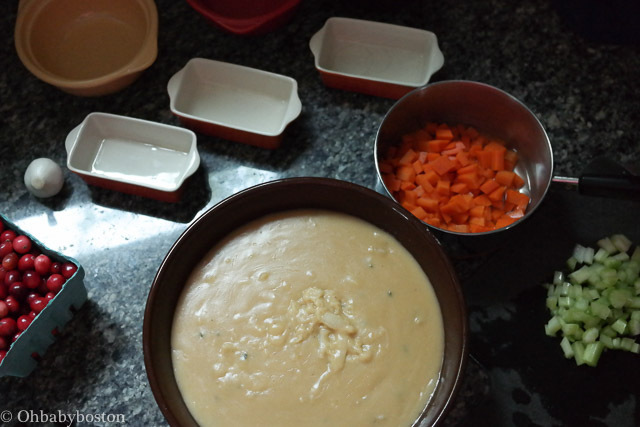 Allow this mixture to cook for 2 minutes and then begin to add the stock one cup at a time. Add 1/4 cup of heavy cream, 1 tsp of salt, and 1/2 tsp of pepper. Then, add the frozen peas, turkey and carrots. Take the filling mixture off the stove. Dice one celery stalk and mix it into the filling. Add 1/3 cup of dried cranberries to the filling. 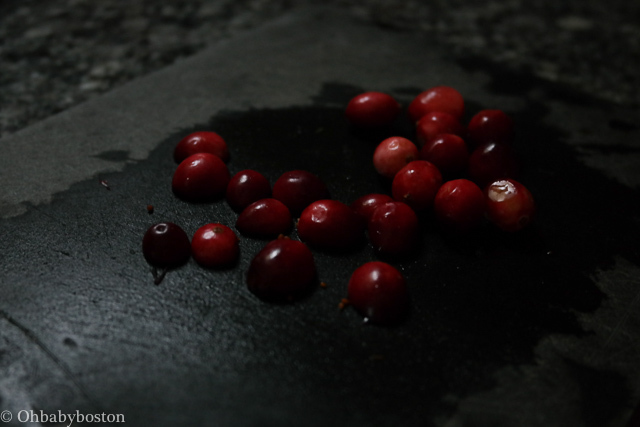 Slice 1/3 cup of the fresh cranberries in half and lay them out on your cutting board. 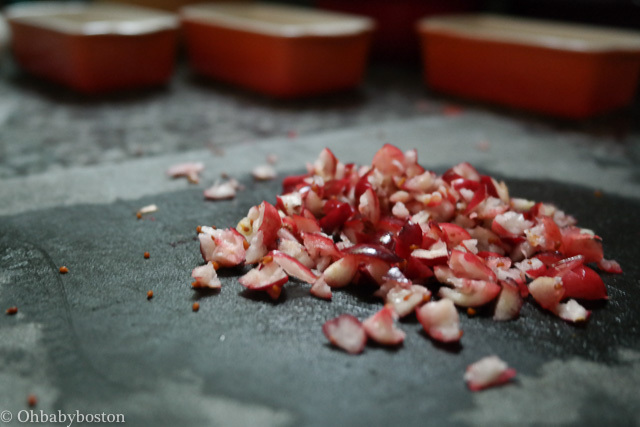 Then, mince the fresh cranberries and toss them into the filling mixture. Halving the cranberries will help you keep all your fingers as they will not roll as you mince them. So now you have about 8 fried sage leaves set aside for garnish. You have your filling made and your pie crust is in the fridge chilling. Preheat your oven to 375 ℉. It should not take too long as it will still be warm from earlier. Now it is time to make those Fall is Here and I Feel Like Wrapping Myself in a Plaid Wool Blanket Pies. 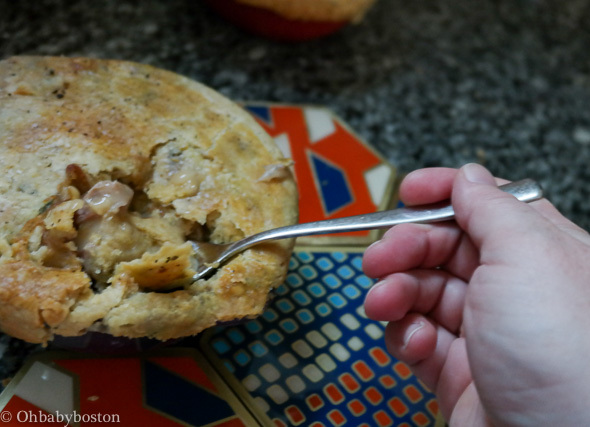 You can play with the different sizes of pot pies. 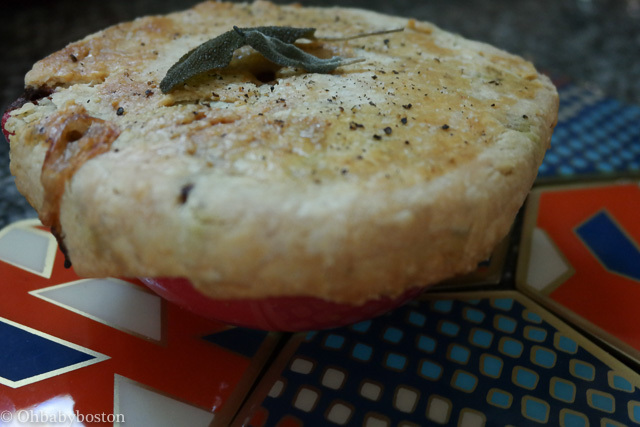 I like to make some mini pot pies because this is such a rich dish. You can use little ramekins or small oven safe bowls. You can also prepare it as one or two larger pies in a pie plate or play with shape and serve it a rectangular baking dish for a family style meal. Once you have chosen your pie vessels it is time to roll out the dough and assemble them. Roll the dough to about 1/8 inch thick. You can use a fork, a butter knife, or fun mini cookie cutter shapes to let steam out of the pie as it bakes. I chose a mini T and Y for “thank you” to cut out of my crust so that the pie could vent as it baked. Once you have rolled out your dough, fill the pie plate with the turkey and cranberry mixture and carefully top it with your crust. I like to put plastic wrap on the counter and then dust it with flour. Dust the pie crust with flour and the rolling pin as well. If the pie crust crumbles give it a minute to warm up before rolling it out. This dough is a bit tricky to work with because it is on the dry side, but it is worth working with for the perfect taste and texture once baked. When you have rolled out your dough (you will use one disc at a time. ), fill your various pot pie plates and baking dishes with the filling. 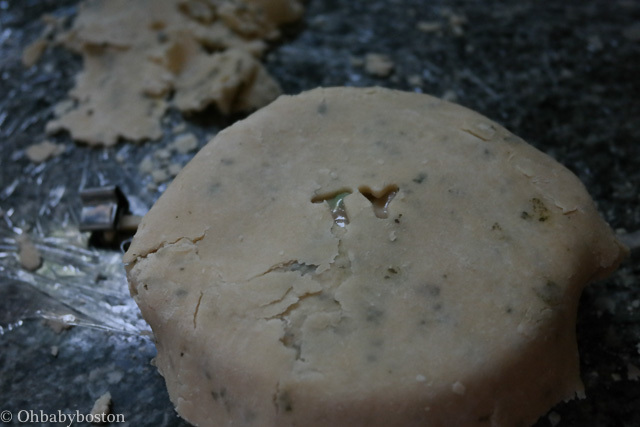 Then, carefully cut out the pie crust so that it has enough extra dough to hang over the edges of the dish. If you are using cookie cutters cut your vents before putting the crust on the pie. If you are making an x with a butter knife or poking several vents with a fork, you can do that once the pie crust is already on the pie. Whisk one egg with 1 TBSP of water. 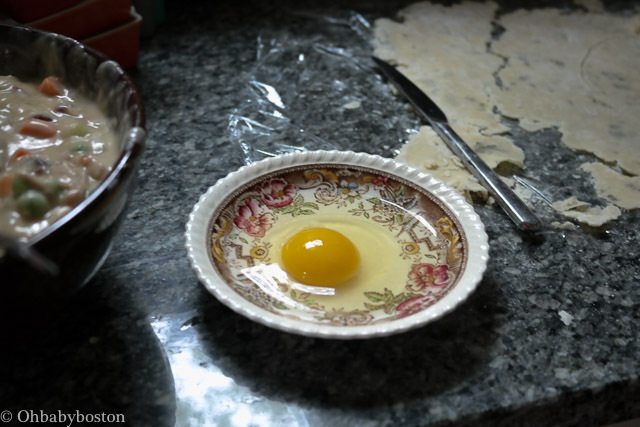 You will brush the undersides and top of the pie crust with the egg wash.
Brush the underside of the crust with a little of the egg wash that you make by whisking one egg with 1 TBSP of water. Then press it gently against the pie plate. Brush the top of the crust with the egg wash and sprinkle with a pinch of Kosher salt and pepper. Place the pot pies onto a baking tray and bake at 375 ℉ for 1 hour or until the top is golden brown and the filling is bubbling hot. Garnish with a fried sage leaf and serve. For a virtual pie cookbook of recipes, here are some more of the #WayfairPieBakeOff Recipes.